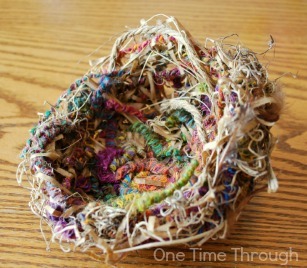 Wouldn’t you love your child to make this stunningly realistic homemade birds’ nest to hold their beautifully dyed Easter eggs this year? Can you believe that my 2.5 year old son basically made this nest by himself (with very little assistance from me)? 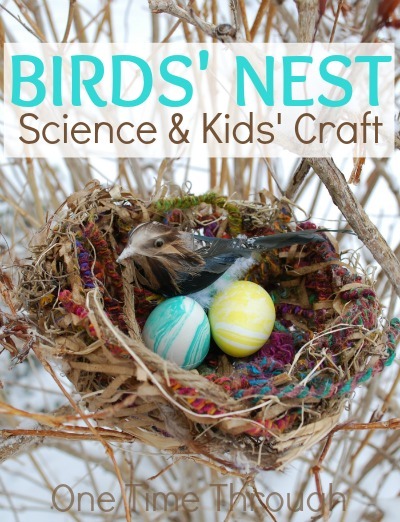 Learning about birds and spring, while developing a little scientist, is all a part of today’s birds’ nest adventure! Amazon Affiliate links have been included in this post. Please see disclosure for more details. 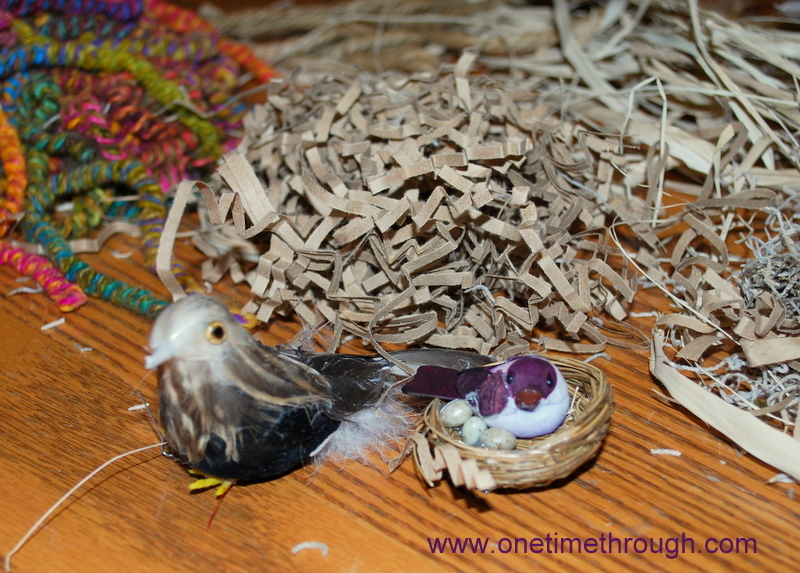 Artistic Note: If you want the nest to look realistic, choose natural coloured materials. For a totally different look, choose brightly coloured string, shredded paper, and feathers! 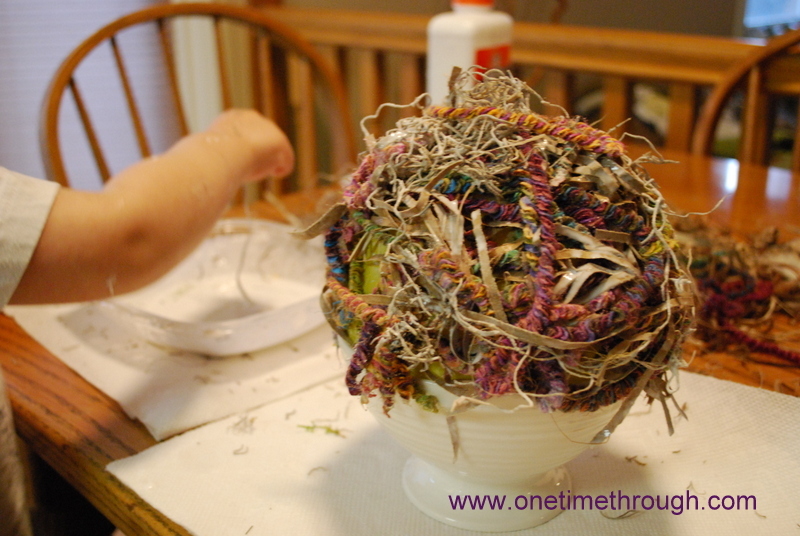 Blow up a small balloon so it fits nicely into a bowl the size of the nest that you want to make. In a large, wide container, mix white glue with a little water to thin it out. SCIENCE NOTE: While you are getting started, this is a great time to discuss why birds make nests! What does your child think? I’ve been working on waiting at least 10 seconds after asking my son a question. I read recently that children under age 3 can take that long to put their thoughts into words! 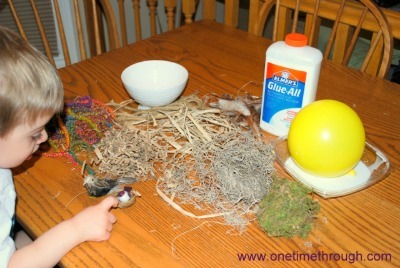 Show your kiddo how to dip the string into the glue and then squeeze it or run it between fingers to get the extra glue off. 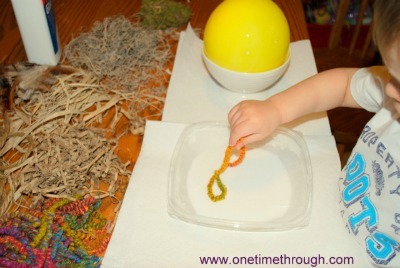 Then have your kiddo place the string onto the balloon wherever they like. 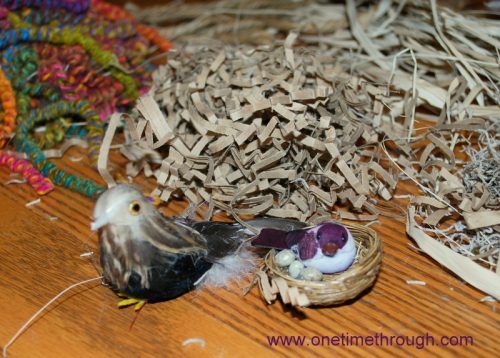 SCIENCE NOTE: As Onetime was working away – we talked about how birds use all of these materials, plus sticks and twigs to make their nests! 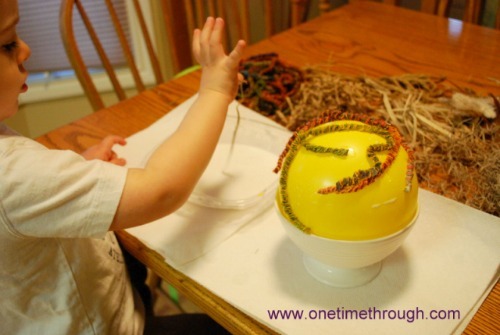 Encourage your kiddo to keep adding string and then other materials until the balloon is covered. Once Onetime (my 2.5 year old son) got going with this, he had a blast! He just needed occasional reminders to add lots of glue to the Spanish Moss and shredded paper. Let the nest dry on the balloon for at least 4 hours. It’s really hard for little ones to wait this long. I had to put our nest “out of sight” for a bit! Last, it was the really fun part – the popping of the balloon! I love how Onetime’s nest turned out! We plan on using this beautiful nest as a centrepiece for our Easter brunch – filled with brightly coloured eggs of course! Kids will learn about many different kinds of birds with this catchy rhyming non-fiction text. Barbara Reid’s plasticine illustrations are wonderfully detailed and endearing. This book is very Dr. Seuss-like in a good way. It has lots of rhyming text and provides a great overview of the peculiarity of different birds from around the world. An oldie, but a goodie packed with tons of information and engaging pictures. These grade three students and their wacky teacher go on a fun adventure when one of the kids discovers a bird’s nest. My son loves all the Magic School Bus books – and I enjoy reading them too! What a great idea! We tried to make a nest with just twigs and mud – didn’t work (and very messy!) 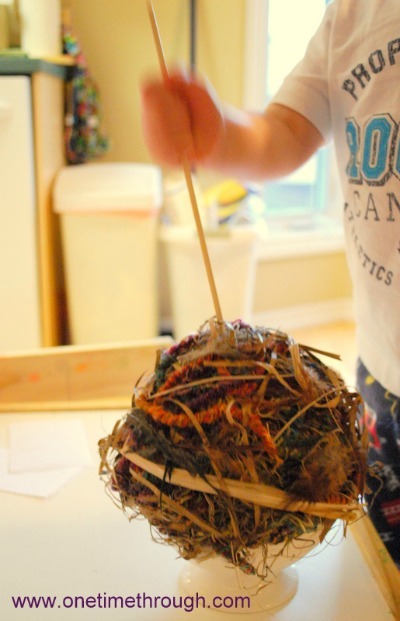 This one looks like a lot of fun – and is a great way to learn about nests! Thanks Emma! Don’t kid yourself – this IS messy! But SO much fun and easy to get great results! This is so lovely! love that you combined natural materials and yarn! Thanks Jenny! Another reader suggested you could even collect your own materials outside too – which would be a whole other adventure! But we took an easier route! I´m off to make that lovely birds nest. Mine is gonna contain all my favorite yarns and fabrics! Have fun! Thanks for checking us out! Wow! I know it had to be fun to make and it turned out beautifully. Thanks Jill – I couldn’t believe how well it turned out too! It constantly amazes me what such a young “artist” can do! Thanks for featuring us on the Thoughtful Spot weekly blog hop! I absolutely love this! I wish I had come across this before Easter but we might do it anyway for a spring activity. We have lots of birds around! Thank you for this great idea! Thanks for dropping by Tina!